Vitiligo is an autoimmune disorder, presenting as depigmented macules/patches and characterized by the loss of melanocytes. It can affect any age group, race, and any skin type. It can broadly be classified into two major forms: segmental vitiligo and nonsegmental vitiligo. Its prevalence is 0.5–1% of the world population. The lack of melanin producing melanocytes combined with oxidative stress due to the accumulation of epidermal reactive oxygen species (ROS) and decrease in the expression of antioxidant genes, makes a vitiliginous skin more prone to cutaneous malignancies but the reports of development of nonmelanoma skin cancer (NMSC) over vitiliginous skin are rare and have been reported mainly following phototherapy for vitiligo., Here, we report a case of an elderly female who developed actinic keratoses (AK) over vitiliginous skin following oral PUVAsol (psoralen plus ultraviolet A from solar light) within a short duration of 7 months. 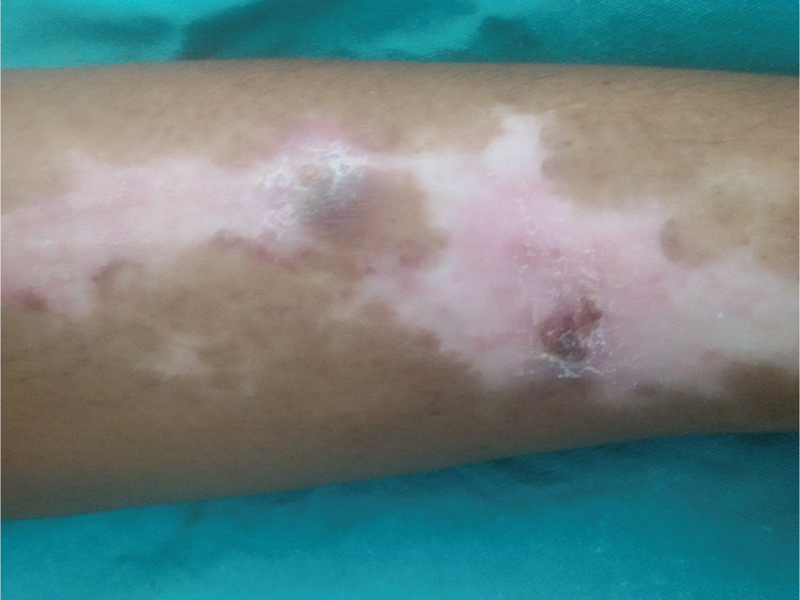 A 55-year-old woman, housewife by occupation, presented to our dermatology department with the complaints of depigmented lesions on the bilateral upper limbs for the last 8 years. She took on and off treatment for the same from multiple private practitioners but with little relief. One year back, she was prescribed oral PUVAsol therapy from outside. Seven months after the initiation of oral PUVAsol, she developed redness and itching over the lesions; the patient as well as the practitioner treating her ignored these symptoms and continued with the treatment. As the symptoms progressed, she came to our institute. There was no history of any irritant application, any topical medication, or any other immunosuppressive therapy. On clinical examination, the depigmented lesions were present on the extensors of the upper extremities, there was erythema over the lesions, there were few nodules present with scaling [Figure 1] and [Figure 2], and there was associated itching. 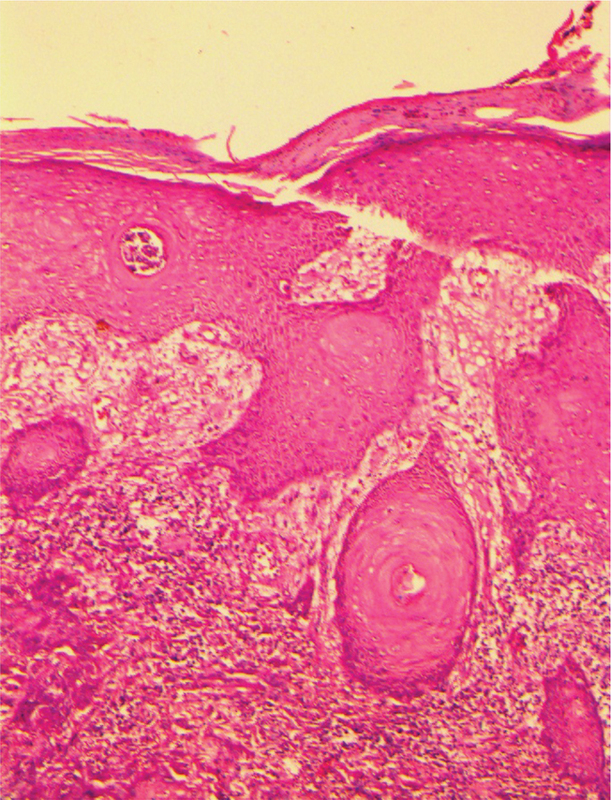 Histopathological examination of the nodule showed parakeratosis, dyskeratosis, and atypia of the keratinocytes with basal cell degeneration, keratin pearls going toward the dermis and plasma cell infiltration in the dermis [Figure 3] and [Figure 4]. AK is a precursor lesion for squamous cell carcinoma. One of the risk factors for the development of AK is cumulative ultraviolet radiation (UVR) exposure. AK in vitiliginous skin has mainly been reported following PUVA therapy and to minimize the risk of development of cutaneous malignancies, it is proposed that the lifetime exposure of therapeutic PUVA should be limited to 150–200 exposures or a cumulative dose of 1000–1500 mJ/cm2. Our patient took oral PUVAsol therapy, 3 days a week, for vitiligo and developed itching and redness over the lesions in 7 months. Although her total exposure was much less than that needed for the development of AK, yet her genetic predisposition and individual susceptibility could have been the possible factor for the development of AK. Actinic keratosis in a vitiliginous skin is itself a rare phenomenon with very few reports in the literature., Adding to it, the rarity of our case is that AK in our patient developed within a short span of 7 months after the initiation of oral PUVAsol, especially when the patient had almost no other sun exposure and no history of intake of immunosuppressive medications in any form. Melanin is a protective pigment that safeguards the skin against the harmful effects of UVR. Since vitiliginous/depigmented skin has the loss of melanin-producing melanocytes combined with severe oxidative stress due to the continuous accumulation of epidermal hydrogen peroxide (H2O2), they are at a higher risk of photodamage and there are more chances of development of NMSC. However, the sporadic reports of NMSC in vitiligo points toward the opposite., The possible explanations for the protective phenomena against the development of NMSC and AK in a vitiliginous skin may be the increased functional wild-type p53 expression in these patients and there may be a direct association between this tumor suppressor gene and the absence of photodamage and NMSC. Another study supports the concept that vitiligo involves the entire epidermal unit in both depigmented and “normal” pigmented skin, and the depigmented epidermis of vitiligo patients do not completely lack melanocytes. In addition, it showed the presence of clustered and single premelanosomes in basal and suprabasal keratinocytes of lesional and normal epidermis, and the retention of single melanocytes in lesional epidermis, by light and electron microscopy. Another study considers pigmentation, stratum corneum, and viable epidermis as the main factors protecting against UVR. 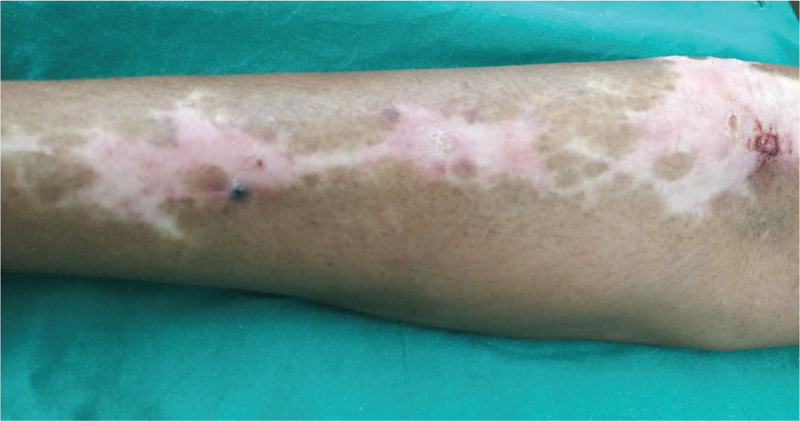 This study concluded that the stratum corneum was thicker in vitiligo than in normally pigmented skin and this hyperkeratosis offers an equally efficient photoprotection as the normal stratum corneum in pigmented skin. Contrary to the above studies, one study discusses the cause for the susceptibility of a vitiliginous skin to cutaneous malignancies showing the role of the major ROS scavenging pathways known as “Nrf2-antioxidant response element pathway,” that induces the downstream antioxidant genes such as heme oxygenase-1 (HO-1) and prevents the oxidative damage. In vitiligo melanocytes, there is decreased Nrf2 nuclear translocation and transcription leading to a decrease in HO-1 expression and aberrant redox balance, thus increasing the oxidative stress, which may be the cause for malignancy. Although rare, the possibility of development of skin cancer in a vitiliginous skin cannot be completely ruled out. Keeping this in mind, a dermatologist should always counsel a patient to protect the depigmented skin from unnecessary sun exposure. For example, in our case where AK developed after PUVA therapy, a patient should be cautiously prescribed phototherapy and a check should be kept on cumulative sun exposure. As dermatologist, we should be wary of the telltale signs of malignancy developing over vitiligo lesions in the form of burning, itching, erythema, nodule, ulceration at anytime during the course of phototherapy, and the affected skin should be carefully examined on every follow-up and treatment should be titrated accordingly. We thank the Department of Pathology, Hind Institute of Medical Sciences, Safedabad, Barabanki, Uttar Pradesh, India. 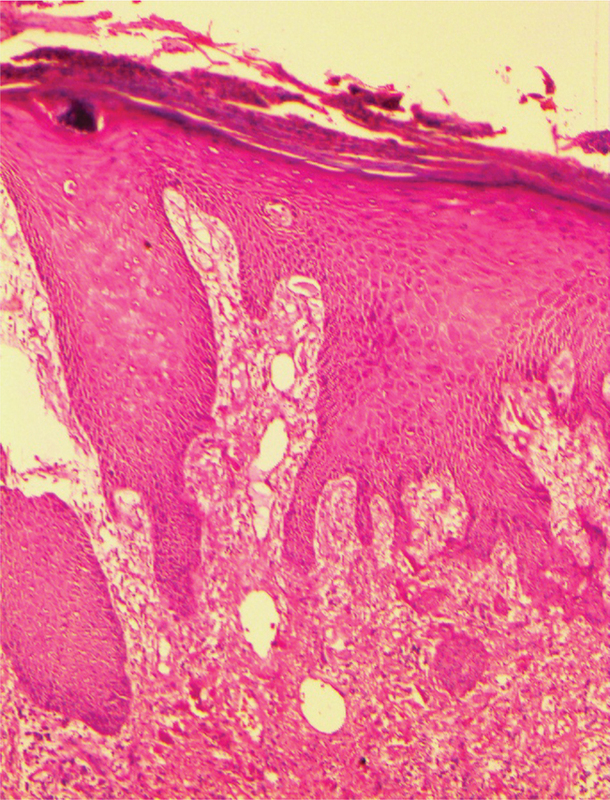 Geel NV, Speeckaert R. Acquired pigmentary disorders. In: Griffiths C, Barker J, Bleiker T, Chalmers R, Creamer D, editors. Rook’s Textbook of Dermatology. 9th ed. John Wiley and Sons; 2016. p. 88. 34–40. Schallreuter KU, Tobin DJ, Panske A. Decreased photodamage and low incidence of non-melanoma skin cancer in 136 sun-exposed Caucasian patients with vitiligo. Dermatology 2002;204:194-201. Garcia-Romero MT, Esmeralda OS, Marisol DL, Sonia TC, Maria LN. Chronic actinic damage in pigmented and depigmented skin of Hispanic patients with vitiligo: Clinical and histological differences. J Clin Exp Dermatol 2012;3:154. Yashiro K, Nakagawa T, Takaiwa T, Inai M. Actinic keratoses arising only on sun-exposed vitiligo skin. Clin Exp Dermatol 1999;24:199-201. Schallreuter KU, Behrens-Williams S, Khaliq TP, Picksley SM, Peters EM, Marles LK et al. Increased epidermal functioning wild-type p53 expression in vitiligo. Exp Dermatol 2003;12:268-77. Tobin DJ, Swanson NN, Pittelkow MR, Peters EM, Schallreuter KU. Melanocytes are not absent in lesional skin of long duration vitiligo. J Pathol 2000;191:407-16. Gniadecka M, Wulf HC, Mortensen NN, Poulsen T. Photoprotection in vitiligo and normal skin. A quantitative assessment of the role of stratum corneum, viable epidermis and pigmentation. Acta Derm Venereol 1996;76:429-32.